The LHS cheerleaders attended NCA Cheer Camp at Kansas State University from July 6th – 9th and did and fared well. The JV Cheerleaders won the Champion Chant category in the Non-Varsity Division for the third straight year in a row. 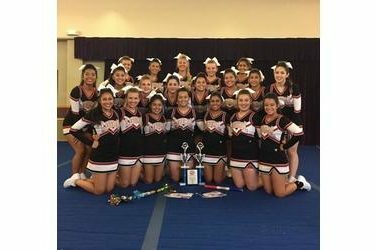 The Varsity Cheerleaders won the Overall Top Performance Team in the Varsity Division. Over the past three years, the LHS Cheerleaders have taken home eight trophies from NCA Summer Camps. Along with these accomplishments, the Varsity Squad came away with the Herkie Team Award for exemplary teamwork and the Excellence in Stunting Award on the final day of evaluations. They also had two All-American Team Members: Gaby Amparan and Ariana Diaz. Gaby Amparan also won the NCA Individual Leadership Award, which is given to one person out of the entire camp who shows outstanding leadership and integrity. The LHS Cheerleaders are currently attending weights three times per week and holding evening practices two times per week in order to prepare for the upcoming fall sports season. They look forward to supporting the Redskins and showing off their new skills for the crowd to enjoy.